I am wearing a safety belt, not a harness. OSHA was in the process of switching from requiring belts to requiring harnesses, and the rigger standing with me is wearing an early version of a harness. I’m wearing a suit and tie. The riggers took one look at me when I showed up and offered me a nylon boiler suit to wear over the suit, as you can see. It was still common enough then for professionals to show up dressed like that for those boiler suits to be kept handy. Now, if I were to show up on site in a suit, it would be my own fault for ruining my nice clothing. I learned fast enough that you can’t dress formally on site – less than a year later I spent a summer inspecting another building in this same complex, mostly wearing black tee shirts with the occasional black tee-shirt with a Batman logo thrown in. We’re standing on a swing stage in a narrow light court. When we were working on the lower floors (this picture was taken near the roof) we could only see a tiny sliver of sky. One day a thunderstorm blew in – not the time to be standing on an aluminum platform – and we didn’t know until it was overhead. I had briefly studied laced steel columns three years earlier in a steel design class, but I had never worked on one or even seen one before. This building was constructed in 1917, when built-up columns (including laced boxes like this) were still common. 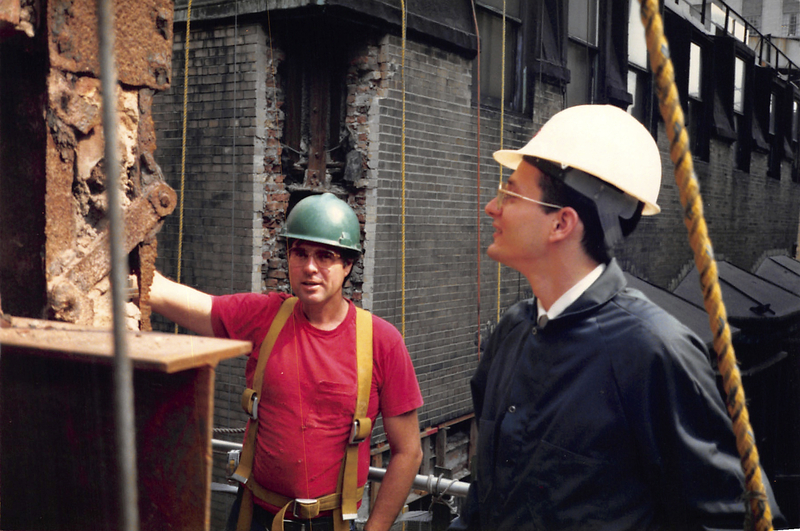 New York’s first facade inspection regulation – Local Law 10 of 1980, was only in its second five-year cycle then. Everyone was learning about how to do this kind of repair, not just me. Fortunate timing: I was able to learn as this subset of our industry developed, rather than coming along after it was all in place.